Another great christmas present idea! Know anyone that loves lipbalms? I can think of someone..
And I bet we all do. 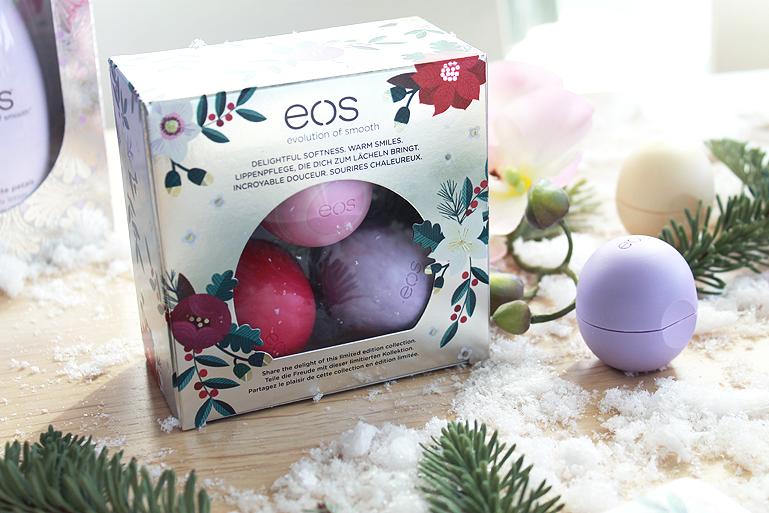 Eos is launching this year for Christmas this box with 3 different lip balms included. This very special trio features new Visibly Soft Honey Apple plus fan favorites Organic Wildberry and Passion Fruit lip balms. Eos Organic lip balm is 95% organic and 100% natural. Packed with antioxidant-rich vitamin E, soothing shea butter and jojoba oil, Eos keeps your lips moist, soft and sensationally smooth. Eos Visibly Soft lip balm is 99% natural. Enriched with natural conditioning oils, moisturizing shea butter and antioxidant vitamins C & E, this delightfully swirled lip balm nourishes for immediately softer, more beautiful lips.